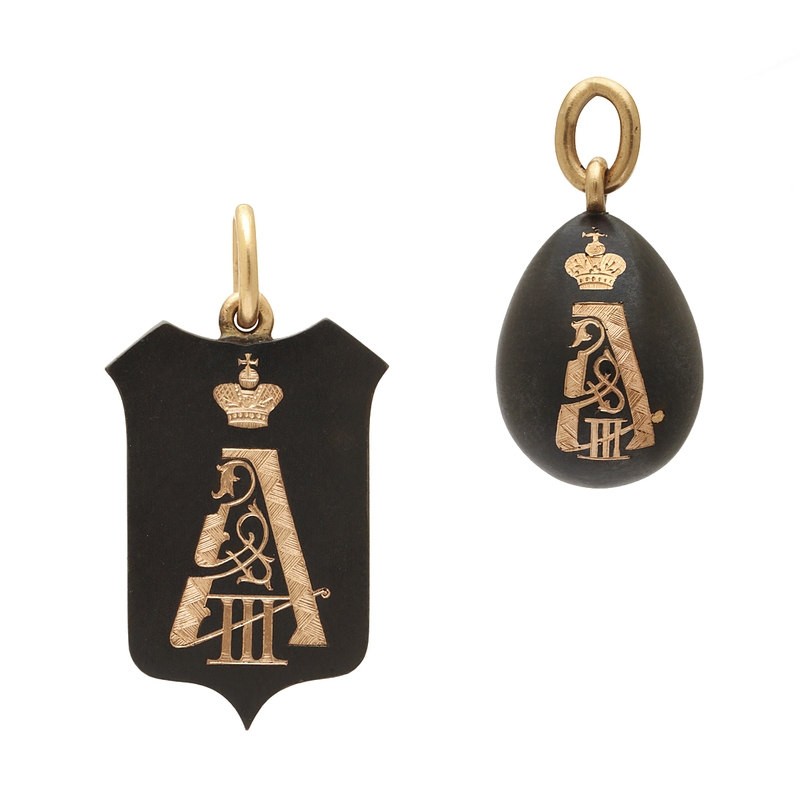 These two miniature gunmetal and gold pendants memorialize Tsar Alexander III (1845 -1894). 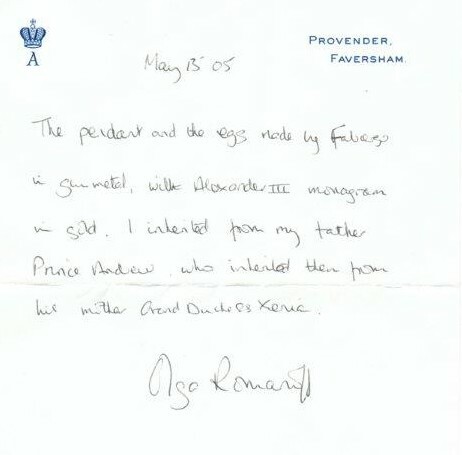 Appropriately somber in tone, the egg lacks ornament but for Alexander’s monogram and crown. 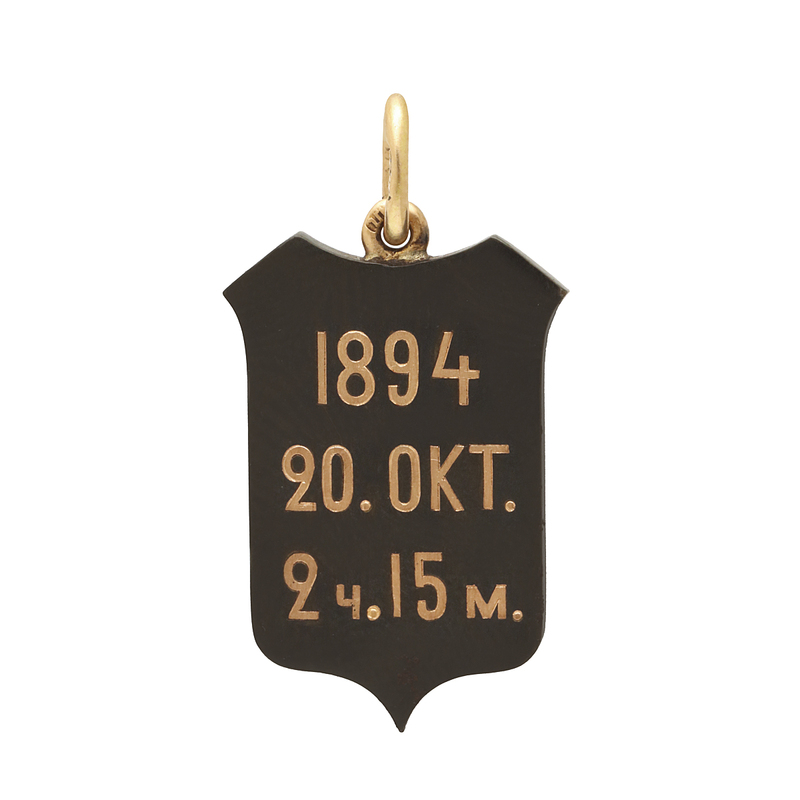 The similarly adorned matching shield pendant bears his monogram and crown on the obverse with his date and time of death on the reverse: 2:15 am, October 20, 1894. Gunmetal’s dark hue aptly signifies mourning and its sturdy nature make it a fitting tribute to the great autocrat. An alloy of copper, tin, and zinc, gunmetal is a resilient material, valued for its ability to withstand heavy loads and resistance to corrosion. These qualities match Alexander III’s character and strength of body. The Victorian journalist and biographer Charles Lowe described Alexander III as the man with the iron mask, referring to his reserved public persona, but the Tsar was a man of iron in many ways. The assassination of his father, the great reformer Alexander II, significantly impacted the course of his reign. Hardened by the consequences of his father’s leniency, Alexander III ruled with an iron fist and staunchly defended autocracy. Described as “herculean” and the “Russian Samson,” the six foot four burly Tsar was an imposing, strong man. He could bend, and then re-straighten, iron fire pokers, crush silver rubles in his fingers, and tear double packs of cards in half, and he often performed these marvels for the amusement of his children and assembled guests. 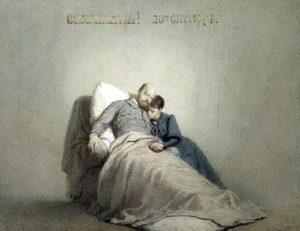 Years later after the accident, in 1894, Alexander’s health began to rapidly deteriorate. Diagnosed with terminal kidney disease that year, a heavy cold exacerbated an already weakened condition. His worsening health in September prompted a move to the country palace of Livadia in the Crimea, hoping he would improve in a warmer climate. Unfortunately, his condition worsened. “He was fully conscious until the last moment, speaking and looking at us until he quite calmly fell asleep into eternal life without any great struggle and in my arm! This egg pendant belonged to Alexander and Maria’s daughter, Grand Duchess Xenia Alexandrovna (1875-1960). It was recorded in her inventory of Easter eggs, a collection of descriptions and watercolor illustrations of Easter eggs and other smaller pieces of jewelry that she acquired between 1880 and 1905, totaling 499 pieces. 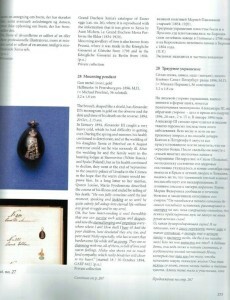 This inventory page is illustrated in the 2002 exhibition catalogue Treasures of Russia – Imperial Gifts. 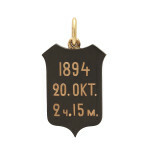 While eggs are traditionally emblematic of life, this egg pendant embodies grief, a sentiment more connected to the famous Fabergé Easter eggs than their opulence implies. Tsar Alexander III began the Romanov tradition of commissioning the eggs. Wishing to comfort Maria, traumatized by Alexander II’s death, he had the idea to give her an Easter egg in the style of one she liked from her childhood home in Denmark. So pleased with Fabergé’s creation, Alexander and Maria granted him an Imperial Warrant to make an Easter egg every year, in addition to other commissions. Initially a remedy for grief, Fabergé eggs became annual tokens of affection emblematic of life. To this day, they are forever associated with Romanov splendor. While simple in ornament, these gunmetal and gold egg and shield pendants are no less precious. Together, they are a testament to the loss of a tsar and his lost world. Fabergé. New York: A La Vieille Russie, 1983. Lowe, Charles. 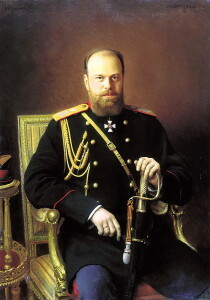 Alexander III of Russia. New York: Macmillian and Co, 1895. 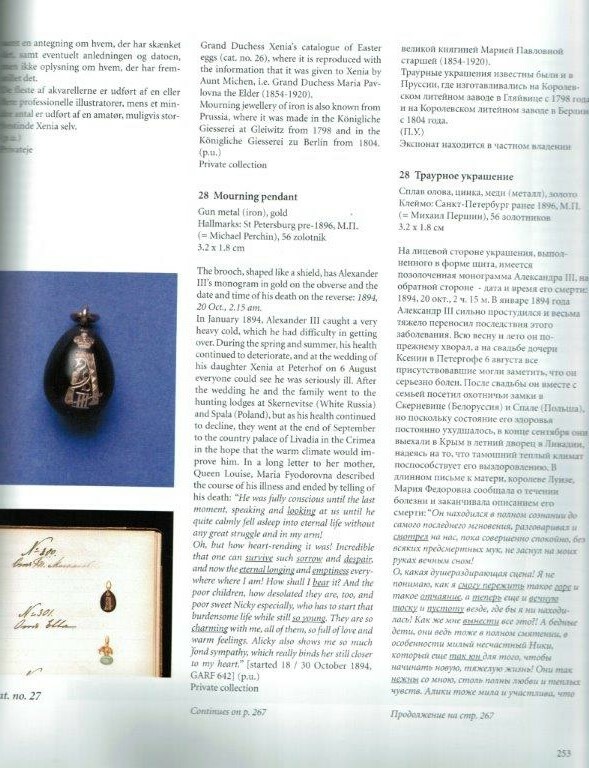 Ruslands skatte -kejserlige gaver – Treasures of Russia – Imperial Gifts. Kobenhavn : Det Kongelige Solvkammer, 2002.